Progressive rock and locomotives seems to be a developing theme for my holidays. Last year, in The Alps, it was a prog rock band playing on a train. 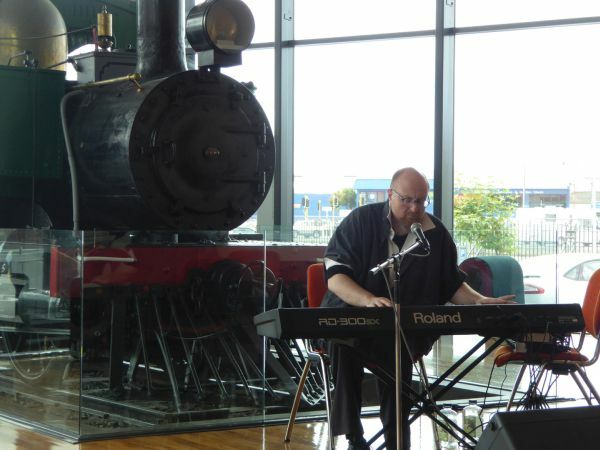 This year, in New Zealand, it was a prog rock artist playing in front of a train! It was a sunny summer Saturday afternoon when I found myself 20,000kms from home in the centre of the second largest city on New Zealand's south island. Like the city from which it takes its name (Dùn Èideann is the Gaelic name for the Scottish capital Edinburgh), Dunedin is known for its rich cultural and musical history, something that is maintained today by having the nation's largest population of students. Dunedinmusic.com was set up to celebrate Dunedin music. In addition to an excellent website and direct help for artists, it also hosts regular Saturday music afternoons in the bright foyer of the city museum. Thus my visit to widen my knowledge of New Zealand history, was extended to take in a series of 30-minute showcases for three local musicians. First of all a keyboard was set up in front of the locomotive for Nick Knox. 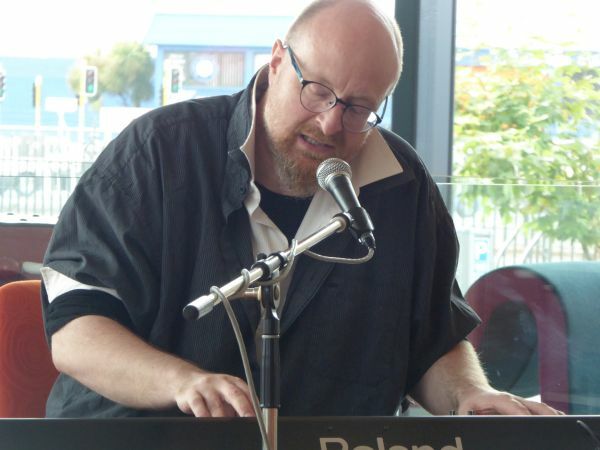 A composer, pianist, and singer from Dunedin, he will be of interest to those who enjoy keyboard-led music that visits classical, baroque, prog and trance-like states, amid an off-kilter vocal style and a deep lyrical introspection. It was five years ago that Knox had a somewhat unorthodox first foray as a performing musician. Having lost both his legs, he was on the rehabilitation ward, learning to walk with his prosthetic. "I was playing in the art room and some of the fellow recoverers wanted to come and be an audience,” he recalled in an interview with the local Otago Times newspaper. "They were so into what I was doing, and so encouraging, that I asked some of my friends working at a small bar whether I could come and play. So, I did. There were kind of rapturous responses. It was a massive confidence boost and set the trajectory." 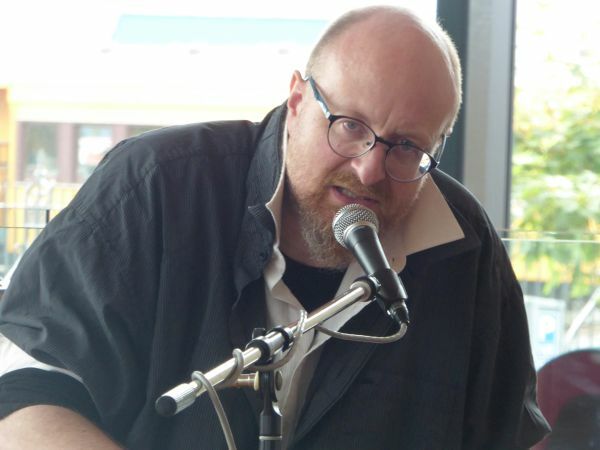 His music and his story was recently the subject of an acclaimed film made in Dunedin for the BBC called The Characteristics of C-Minor. In his own words Nick's emotionally-charged music is described as: "Rammstein's tour bus, with a troupe of Tibetan throat singers on board, crashing into the middle of a Bach recital." As this suggests, there is great variation in Nick's music. However from this brief showcase, the styles change between, as opposed to within, each composition. We have the classical/baroque track, and then one with a more trance-like groove, and then a more pure proggy number. Around half of the tracks were instrumental. The remainder feature Nick's rather unique, gruff, slightly horror movie-esque vocal delivery. Nick has so far released two albums, Resuscitate (2014) and Shades (2011), which can both be heard from his Bandcamp page. The candid lyrics have a recurrent theme of damage; the scars of many years' isolation and mental as well as physical ill-health. It maybe this which accounts for the lack of anything more than a series of in-between song 'thank you's coming from the performer. That is a shame, as I feel a personal explanation of each song and the songwriter would add far greater depth to the show. Equally, I feel a wider use of Nick's repertoire of influences within the individual tracks is needed, to take his song writing up to the next level. However from this brief showcase and a later exploration of his music and background, I would say that Nick Knox is creating a haunting, strange, yet rather unique style of keyboard-driven music that is deserving of an audience far outside of this lovely city at the southern tip of the habitable world.